This is very, very tentative and subject to much change, so don't take it as gospel... i'm just trying to get some data down and then it can be tweaked or adjusted as needed. If divided up into 'lots' of days, each larger contributor getting 3 days. I realize these are tentative prizes too. 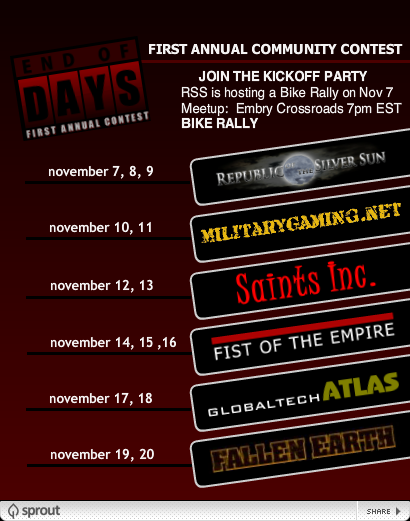 Nov 7,8,9 RSS - Netrillium - a Dune Buggy, a Motorcycle, and 1,000 rounds of ammo (winner's choice of standard ammo types). Contest type: contestants to answer a question about our clans history (by visiting our site) and submit a good screen print of the moon (the silver sun, our emblem). Contest type: possibly just /enter.. don't want to overkill them with burnout of screenshots or anything. Too long? Too much? I'd rather not take it past 15 total days. but also want to really feature those contributing. For those who would need some type of voting, it'd be 2 days of entries and 1 day of voting by players. Voting not a requirement at all and can be simply picked by the clan designees as well. Those not requiring voting could have 2 days of entries and 1 award winner day, so the winner gets featured as well. Once I know the media specifics we'll create and send you banners. BTW, will this get any mention on Apoc Radio? I love those guys. -Looking forward to a great contest. Thank you GTA and all the other clans out there. If you are interested in creating your own banner... i might be amenable to that.. or creating a template. I'd be open to that as well perhaps... but probably would prefer some consistancy... maybe a base template of what I want on there and you can free edit the 'free' space?!? While much of the atlas is pictures and graphics, i'm not an artist here.. well, at least not one with good graphical skills (which is why I try to keep much of the graphics relatively simple, but hopefully effective. We are working to get some Contest Banners made, but I'm sure like you've encountered, we are hitting the wall of talent and free time. I hope to have something ready for you to look at this weekend. It may be great or it may be clunky, but it will be new..
take your time.. if your person wants to create template or anything that is fine. Probably be much better than my own. contest name tentatively changed to 'end of days'. first annual notation might be nice. I'd prefer the last one though but any is really acceptable depending on design. If you really have a person working on it, that'd be great. The template width cna expand to 900 and 90 height.. i'm flexible on height..it could be more as needed but don't want to get too huge.. but it's a shortlived contest and even double is okay. needs to be drop and drag to plop in another clan logo if you want to contribute a template. I'd probably defer to your artist for the duration of the contest... but if you want a something tailored.. it's probably the best bet. here's a very quick sample of what envision..
some standard background that floats from left and fades out just before after the 'clan logo' might be nice.. it'd look good with the sky stretching that span fully. Just an idea.. i hope to be trumped by better ones that include those elements. I do want the atlas logo to have a fully black background but everything to the left is up for modifying. Great concept piece. You're right, it would be good to expand the sky across the entire banner. Let's see what we can come up with. I'm not sure what quiz we can use for our donation, I guess some obscure military trivia or something, but these days Google does all the work for you . It preferred, it could be a 'go to our site and get the password..then email to xxxxxx to enter. advertise the hell out of your clan. It's a main point of the contest. Get your name 'out there', especially if recruiting, but not required to be recruiting at all. It's a goodwill gesture to the community, but you could reap tangible benefits. win for you, win for me. since this is working out to be all clans (probably to be expected), i'd also like to post a feature for each.. a brief (5-7 paragraph description) on the site below the contest description. I don't want it to run all down the page, but it may be an added lure to tell people about your clan who breeze in but do not plan to enter... they still might read it and it may spark interest. Let me know how I can help and promote your clans. arrrgh, i'm gonna probably we a meanie and withraw that offer of a template. I'd like one though... just for me to create one is much easier for all using a program that uses .bap files. I can make a semidecent cutout.. but am wholly not good at it. I am a pretty good wiz with bannermakerpro though which is what i use mostly for text graphics and pics. It's incredibly simple but produces some good results with the right artistry. But it is still very simple. It would make it much easier if I got 'elements' like pics to include and/or other graphical elements and then made or recreated on so I can re-use it throughout the contest. The basic graphics are the bigger issue.. I really can't create original graphics... but i'm pretty good at incorporating them into a final piece. Here is an early attempt at a Contest Logo. It needs work (like listing the prizes, including the word CONTEST, and general lay out). But I would like to hear everyone's thoughts. How should I handle the contest details? Should the moon be centered? Any problems with the clouds obscuring the sponsors names? I have to work early on Sunday but will tackle this again in the evening. Also I created this in GIMP, and can share the raw files or create separate pieces to be used as templates. this allows a 400x90 picture to be simply slotted in with only minor adjustments to the text and dates. Looks great! I like the colors and how easy it is to modify the dates, clans, and prizes. Good work. I may use the other banner for the Race RSS is working on, or would you mind if I modified your template? go for it, use whatever you like. Here's how my sprout is looking. This is just a screenie...eventually it should be able to drill in to a page about each clan and the specific contest... everything is tentative still and subject to changes. It's just a mockup for now and the dates and details are not correct. This will replace the scrolling main banner that currently displays the 'Official fe manual now available' for duration of the contest and about a week prior to hype the contest which means about this saturday or sunday. Thanks for giving MG those dates, The Marine Corps Birthday (10th) and Veterans' Day (11th) couldn't be more fitting. Well, it looks like there will be major revisions to the contest schedule coming up... just an fyi. We will have a firmed up list tomorrow but it's only astroturf and not real dirt and grass yet anyways. changes will likely continue after publishing, but we hope to keep them to a minimum. HI i'm the new FE clan leader for MG. USMC Luke is to busy and has alot to deal with rite now. he is still the leader of Militarygaming.net. as his apointed FE leader I have the contest items in my vault. Still not sure what to do about the contest hope you guys can handle that! and just let us know who wins! no worries. I can come up with something and hopefully something appropriate for those holidays.